Lemonade Makin' Mama: Black Friday pop-in- and winner! Black Friday pop-in- and winner! Hey sweet things! How was everyone's big Thanksgiving? We had a hopping house full and it was wonderful! Lots of little ones playing, giggling, running and shrieking through the house, delicious food to enjoy and lots of blessings to count. Thankfully, it was a hit. Whew! As was the kids table... we let the big kids sit with us, and Ava corralled the littles here for a coloring session. Sadly one of Adrain's sisters and her man weren't able to make it at the last minute so we were short two peeps but we still gathered on the porch for a few family photos. This crew is fun. I used one of the tiny trees I had last year (two hoodlums claimed two of them for their rooms as well) and popped it into an old bucket. Holy cuteness Batman! I also had this sweet print that had been selling in my Etsy shop (everything is sold out with the exception of custom orders currently) enlarged by Staples, to poster size, and mounted it just like I did this sign. I am in LOVE! And speaking of signs... we'll call this a mini-Fabulous Feature. 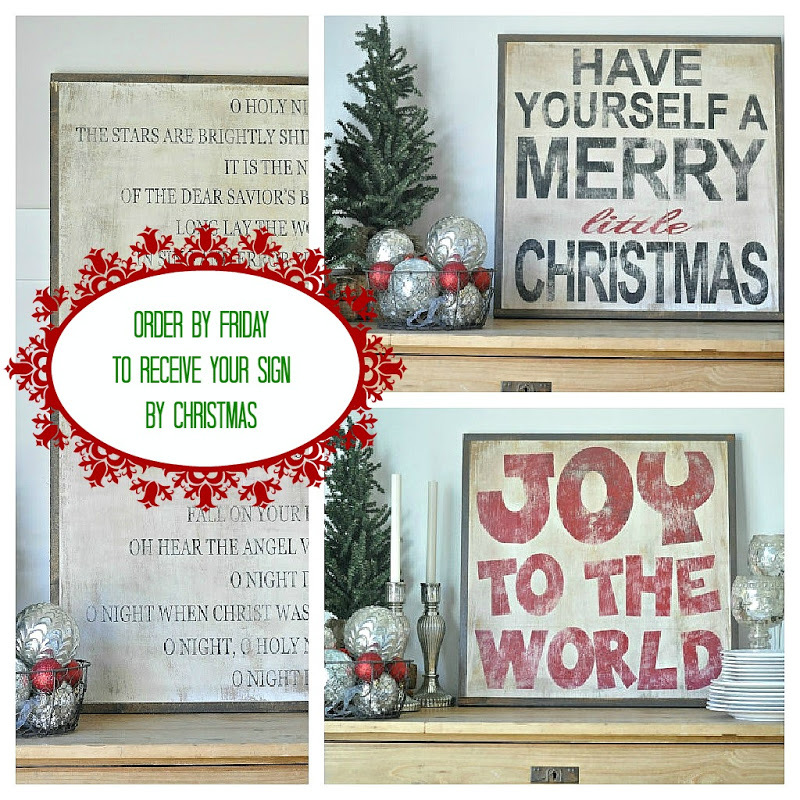 If you are looking for a darling sign for your home... I must recommend my sweet friend Tara's signs. She is still taking orders TODAY for signs delivered by Christmas.. and if you use the coupon code "HOLLYJOLLY" when you check out, you can receive 10% off your order!! Eeek!! That's pretty fabulous, wouldn't you say?! NO WAY!!! I can't believe I won! This is the second time of won one of your giveaways. Lucky me! Thank you so much!! of won? I meant to say I've won. :) I will email you tonight. I'm off to take my kiddos to the movies. Oh my goodness. I had no idea jj was upside down in the picture. Love it. We had a blast. I absolutely love that we can now enjoy these times. Life has changed so much the past year. I love you all. Thanks for a amazing dinner. Awesome pic! My fam is a tad bit... how should i say ... UPTIGHT.... so i will NEVER get one of these! Your family picture is priceless! I love it! I am off to check out your fudge recipe! I can already feel my pants get tighter,lol! :) Have a great weekend sweetie! suuuuper cute kiddie table...looks a little like mine ;) crayons. gobble plates. I saw you got your tree today. not feelin it quite yet. maybe next weekend. i'm sure it looks beautiful by now! We had people order some signs because of your post! Thank you friend....your kind words blessed me. Those kiddie plates, that PIE, the fudge, every single one of those signs, that tree in the pot....all fabulous!! And that family photo....totally cute! Love this post, and you look beautiful holding that scrumptious dessert...the pie crust looks amazing! Listen little lady...YOU inspired me to take up knitting. Thank you so much! I mentioned you in my post today! Come and visit! I am loving the guest room! Might I ask where you got those adorable little trees? I have a spot that would love a tree like that... And the lights are just precious! Full blown Christmas spirit going on over here! I LOVE her shop!! I have a couple of her signs and my last one was the joy to the world in red. LOVE them and they are so well made!! Insipired and confessions about red.. Focusing on the season of TODAY. And a GiveAWAY!